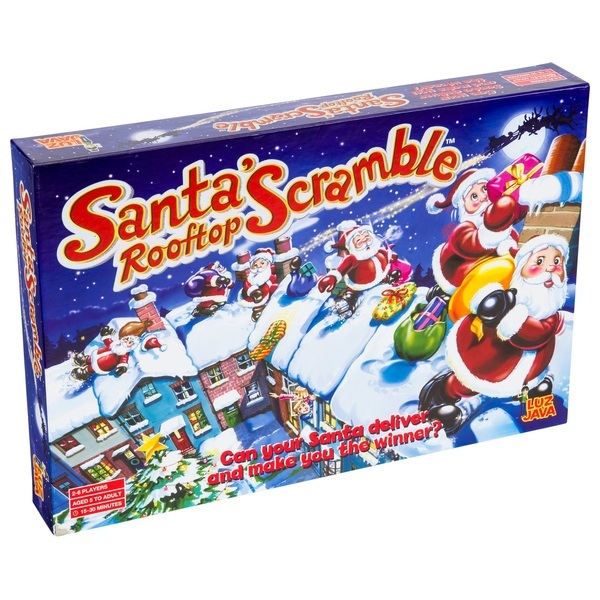 Santa's Rooftop Scramble ia a fun-filled family board game full of the excitement of Christmas! Players take on the role of Santa and have to deliver the right presents to the right houses. Pick-up the Christmas List cards to learn what the child at each house wants, then flick the spinner to prepare the presents to give. Once you have your complete Christmas list go to the elves workshop to load your sack of presents. Roll the dice to move around the rooftops on the board and drop your present through the letterbox, once you land on the right box. It’s not as easy as that, there are some Surprise and Transport cards to pick-up if you land on the boxes, will they bring a Christmas miracle? The first player to deliver everything on their list wins the game!